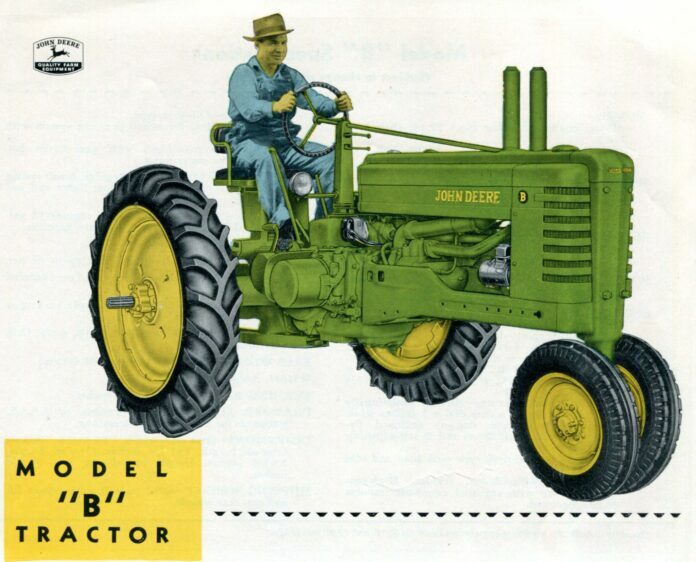 While doing some research for another article, the thought occurred to me to put together a list of the 10 most popular John Deere two-cylinder tractors by number produced. However, this seemingly simple procedure becomes more difficult when you start trying to figure out what to consider a “model.” In the first list, you’ll see here, the tractors that constitute a “model” are those that differ only in axles or wheels. Thus, the “BN” and “BW” were included with the “B,” while the “BR” was not. Likewise, the “M,” 40 and 420 include all of the wheel tractors, but not crawlers. Good point—let’s try that list again, but this time we’ll divide the “A” and “B” into unstyled, early styled and late styled. The “D” we’ll divide into unstyled and styled. For the “G,” we’ll go unstyled, add the “GM” and early styled together, since they were basically the same tractor anyway, and then the late styled. Here’s the way they stack up now. Sorry, Mr. 70 guy, but as you can see, even when we divide the letter series tractors up into subcategories, only one number series tractor cracks the top 10. But just so that you don’t pout, we’ll add the number series tractors together. Of course, that means that to be fair, we also have to add the “A,” “B,” “D” and “G” numbers back together. As you can see, things look a little different now. Another way to look at it would be to divide the total number of a model built by the number of years it was in production. If we added in production numbers for New Generation 20 series and Generation II, 30 and 40 series tractors (which we don’t have accurate production numbers for, it would be interesting to see where the 4020, 4430 and 4440 might end up. My guess is that the 4020 would end up in the number 4 slot, while the 4430 and 4440 somewhere in the 6 to 8 area.